I love smoothies because they’re easy, fast, and so simple to customize with your favorite flavors. Last spring I posted chocolate raspberry smoothie and tropical green smoothie (spring is clearly the start of smoothie season for me). 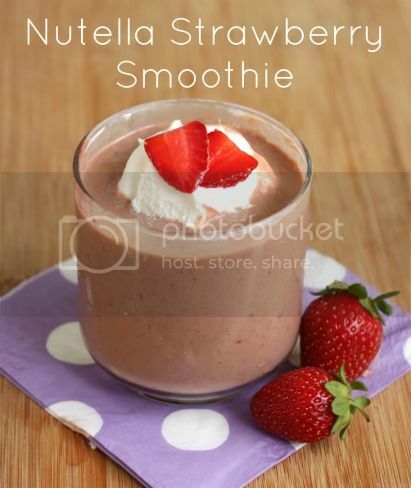 This year I’m feeling a little more decadent, plus I’m still going through my Costco supply of Nutella, so I knew I had to try it – Nutella in a smoothie! I only put in one serving size of Nutella to keep it reasonable, so the smoothie is mostly yogurt and fruit. Strawberries and chocolate are a classic combination so I thought they would be a nice compliment to the Nutella flavor, which turned out to be true. I used frozen strawberries but now that’s it’s strawberry season, feel free to use fresh and add some ice if you need to make it colder or thicker. Have fun with the recipe and play with it – it would be great with raspberries or other seasonal fruit. The smoothie is perfect with a dollop of COOL WHIP whipped topping for added creaminess. Serve with a pretty straw and enjoy it in the spring sunshine. Place all ingredients in blender and process until smooth. Add additional Nutella or strawberries to taste. Serve in a glass with a fun straw and a dollop of COOL WHIP if desired. This is just one of the many ways I get creative with COOL WHIP, making every dessert more delicious. Share what your kids love about COOL WHIP and you’ll be entered to win $500 cash! Visit the COOL WHIP Facebook page to see more recipes and to share your own COOL WHIP creations! Sponsored posts are purely editorial content that we are pleased to have presented by a participating sponsor. Advertisers do not produce the content. Official Sweepstakes Rules.